Today Apple unveiled three products to the world: the iPhone 6, iPhone 6 Plus, and Apple Watch. The Apple Watch won’t be launching until early next year and it’s more appropriate to talk about it in relation to the booming smartwatch wearables market happening. In terms of the iPhone though, we’re seeing a slightly different story from years past. This year, we are greeted with two (much) larger models of the iPhone people have grown to love. Coming up from the 4″ screen of the iPhone 5 and 5S is the iPhone 6 at 4.7″ and its bigger and more expensive brother, the iPhone 6 Plus at 5.5″. The iPhone 6 is the best iPhone to date with a large screen that is just right for most people and the best version of iOS to date, but it’s still the iPhone everyone has fallen in love with. I am quickly going to dismiss the iPhone 6 Plus right away. You may be tempted to ask what the difference is besides the size of the screen. The answer would be a clearer 1080p screen and slightly better battery life. However, the trade off here is a massive phone that is just too unwieldy for its size. Many Android phones, and I hate to make the comparison, but Android phones are the major competitor in this screen size market, make up for the larger screen by significantly reducing the bezel, as seen below. 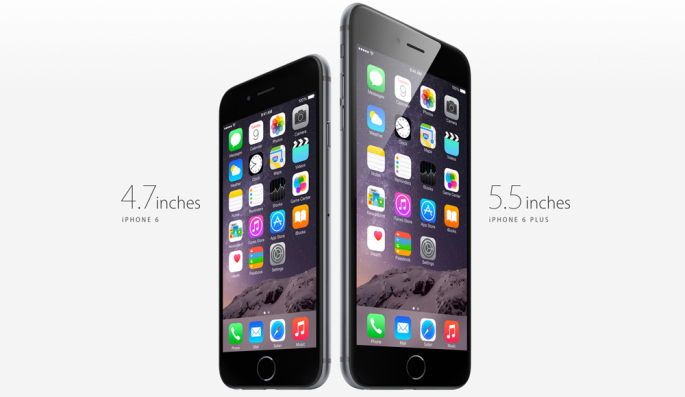 The iPhone 6 Plus has the same amount of bezel as any other iPhone, making the phone taller. It’s no wonder Apple included a quick double tap function to move everything to the lower half of the screen for easier operation. Now, let’s talk about the iPhone 6. It is, to date, the best iPhone in my mind. Its 4.7″ display is the right size for most people – honestly, the iPhone 5’s 4″ screen felt tiny and it was very difficult for me to work on it. I’m going to ignore the fact that the iPhone 6 doesn’t have a 1080p screen, but it is at least beyond the 720p definition of “HD.” The iPhone 6 also keeps much of what made its predecessors so popular: a fantastic camera, smart design, and a OS built to the hardware. Speaking of the OS, iOS 8 is also the most robust version of iOS. Extendability allows apps to finally share information with each other and actionable notifications along with notification widgets make it easier than ever to respond to text messages. iMessage also saw a significant increase in features with muting group messages and sending voice messages. Not only that, but users will also be able to use third party keyboards such as SwiftKey, Swype, and Flesky for all applications. Jealous of your Android friends who had great auto predictions or the ability to swipe through letters? No longer. To top it all off, the iPhone 6 brings with it NFC (near field communication), which Android has had for a few years now, to allow mobile payments similar to MasterCard’s PayPass. With any luck, this will give mobile payments more traction in the market place and help speed along the adoption of this technology in lagging parts of the world such as the U.S. The iPhone addresses the security part of mobile payments with its TouchID sensor although I’m sure people will still have concerns about it. With some new hardware that brings it to par with its Android competitors and an OS that is more competitive in functionality, the iPhone 6 (not the Plus) is a fantastic phone… for the iPhone user. At the end of the day, I doubt any of these changes will sway current Android users to switch to the iPhone. I imagine some Android users who have had horrible experiences with their phones (does anyone remember the HTC Thunderbolt or Samsung Charge? ), may jump ship, but the majority will continue to stay with Android for its customizations. iPhone friends, rejoice, the iPhone 6 is here and it’s everything you could have wanted in an iPhone. After 3 years of speculation, I can finally scratch off “NFC” from the “things the iPhone needs” list. Sorry, I had to end on a sarcastic note.